Browsing: / Home / Santry Sport TaeKwon-Do 3 New Black Belts. Ryan Hayden, Conall Gleeson and Kacey Boyd. Santry Sport TaeKwon-Do has 3 new Black Belts, Ryan Hayden, Conall Gleeson and Kacey Boyd. Ryan, Conall and Kacey all started training in ITF TaeKwon-Do from the age of 7 years old. Ryan 15, Conall 14 and Kacey 13, all 3 successfully past the Irish TaeKwon-Do Association’s summer Black belt test in Holywell Community Centre, Swords on Sunday 10th of June. All 3 were promoted to ITF first Degree Black belts after a long day which started at 10am Sunday morning and didn’t finish until 5pm Sunday evening. The ITA Black belt test covers all aspects of ITF TaeKwon-Do, Fundamental movements, hand techniques, foot techniques. Then Pattern Black belt Tul, optional Tul and 2 coloured belt pattern that the judging panel select. Then the Santry 3 went to do their theory question’s on TaeKwon-Do from the ITA student grading manual, then they moved onto power, 1inch bard for juniors with a hand strike and foot strike, which all 3 broke the boards successfully. Then all 3 moved onto ITF step sparring, 3,2 and 1 step sparring routines that the student’s must prepare themselves, then straight into 2 minute self defence routine the students have prepared. Next is sparring, ITF TaeKwon-Do sparring rules apply, each student’s completed 5 rounds of 2 minute sparring with different opponent each time. Then to complete the grading all 3 performed special technique, Ryan performed flying side kick over his chest height rope and broke a half inch board. Conall performed jumping front kick kicking through a 7 foot height competition board. Kacey performed a flying side kick over her chest height rope and broke half inch board. All 3 received their National Black belt certificates and in the coming weeks will be issued with their ITF TaeKwon-Do Black Belt Dan Certificate and ITF Dan number which now enables all 3 to trial for the Irish National Team in qualifying tournaments ran throughout Ireland. Santry-ITF Instructor Darren Doherty ITF 4th Dan said. I am delighted with all 3, the hard work all 3 put into preparing for the black belt grading, preparation classes in Santry and Cabra 3 times a week for the last 6 Months building up to the grading. 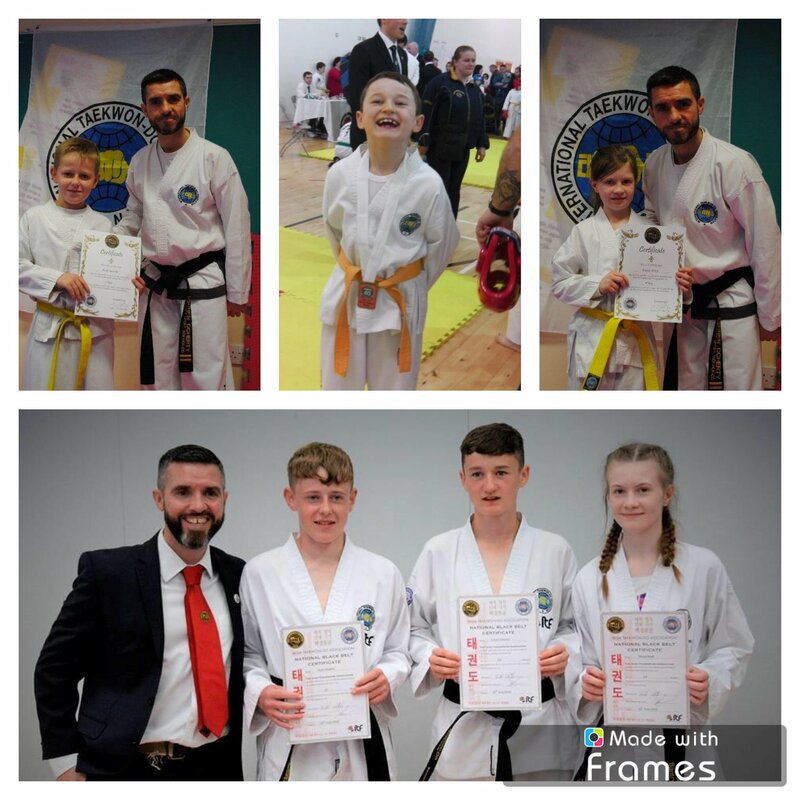 Competing in competition’s on the weekends and thats with all the other sports all 3 do.I am really proud to have Kacey, Ryan and Conall as my students, I have seen them grow up in TaeKwon-Do and couldn’t be more prouder.